Within the K-12 scope and sequence, pre-algebra marks the beginning of the second major developmental milestone spanning kindergarten through calculus. The first major development, typically within the domain of grades K- 5 math instruction, is the concept-procedure integration of the four operations through fractions and decimals and the 400 math facts. The algebra strand relies heavily on the developments achieved in the elementary strand because the major fundamental for elementary grades mathematics is addition, subtraction, multiplication, and division through fractions and decimals when we know how much we have; and the major fundamental for algebra is also addition, subtraction, multiplication, and division through fractions and decimals, but in algebra, we may not know how much we have, because in algebra, there are variable expressions and variable equations. Additionally, the combination of learning fractions and decimals across the four operations and developing automaticity with the 400 math facts during the elementary grades directly supports the development of automaticity with the integer facts and rational numbers applications across the four operations necessary for simplifying variable expressions and solving variable equations. Completing fifth grade does not necessarily indicate students’ readiness for pre-algebra – only the full concept-procedure integration of the four operations through fractions and decimals and automaticity with the 400 math facts does. Therefore, readiness for pre-algebra can occur at any time the student(s) has achieved this developmental integration, because if students are required to begin pre-algebra without having achieved the necessary first major fundamental development, the prognosis for success in algebra is questionable. To cover this voluminous and essential foundation in elementary grades mathematics, I have created two seminars: Making Math Real: The 4 Operations and the 400 Math Facts (4 Ops) and Making Math Real: Fractions, Decimals, and Advanced Place Value (FDAP). 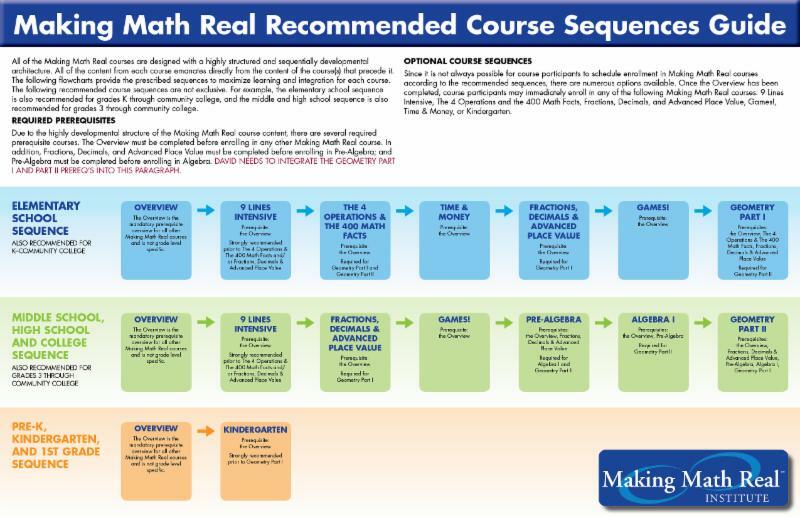 At 12 days each, these are the two longest seminars the Making Math Real Institute offers, and since they provide the critical foundation for the entire algebra strand, they are the only two large-scale (seminars of 10 or more days) institute courses offered once per year, every year. Elementary math provides the initial fundamentals of all future math, therefore its developmental/perceptual demands are basic. 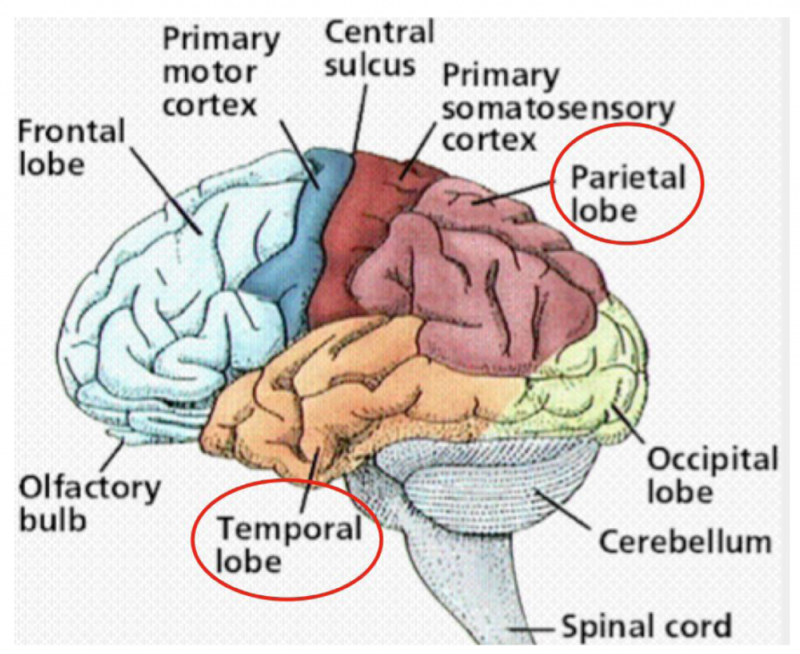 In elementary math the developmental/perceptual focus for students is to activate their working memory/comprehension picture entirely from the symbols, which is achieved by guiding the students from the concrete to the abstract. This means students’ original working memory/comprehension picture of all the math content is derived entirely from a direct concrete experience of the math, and once established, teachers structure the systematic transfer of the concrete working memory picture to the identical working memory picture expressed by the symbols: math symbols are a short hand code to express what is real. Symbol imaging for numbers is therefore one of the principle sensory-cognitive developments that supports the working memory demands of elementary mathematics. Symbol imaging is the combination of the following four self-regulatory executive processes: perceive, hold, store, and retrieve sequences of numerical symbols. Symbol imaging is directly engaged both for learning the math facts and for concept-procedure integration of the four operations through fractions and decimals. In learning the math facts, symbol imaging allows us to fluently perceive, hold store and retrieve the sequences of symbols comprising each of the math facts; and in learning the four operations through fractions and decimals, symbol imaging is also required for successfully activating the concrete working memory picture from the symbols. 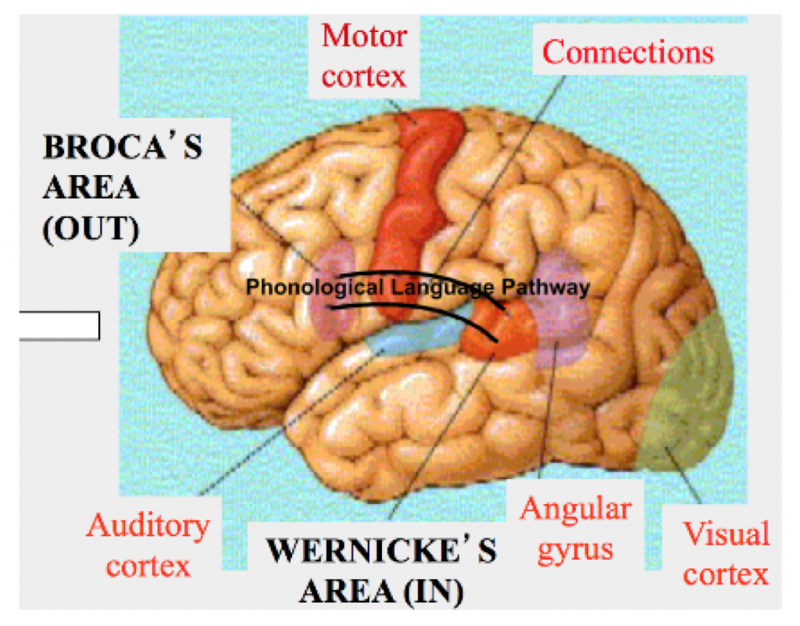 The sensory-cognitive development necessary for activating working memory from the interrelationship of the symbolic details is called detail analysis. Detail analysis is a higher order executive process than symbol imaging and depends on the development of symbol imaging as its basis, because to be able to analyze the interrelationships of symbolic details, students must be able to perceive, hold, store, and retrieve sequences of numerical symbols to support analyzing them mentally. Detail analysis refers to the ability to select out irrelevant details, focus in on key details and link key details back to the big picture of comprehension. 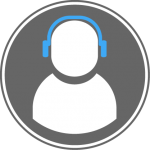 Detail analysis also includes task monitoring as part of its function as a cognitive editing tool, enabling us to check and monitor our work as we proceed through problem solving. All math has a developmental focus and a content focus. They are entirely distinct, yet the two interconnect constantly in support of one another. The developmental focus of pre-algebra is to engage and strengthen students’ applications of detail analysis in support of their activating and sustaining working memory by perceiving the interrelationship of the symbolic details. The mathematical content focus of pre-algebra is to introduce students to a new kind of problem solving: simplifying variable expressions and solving variable equations. Poster #1: Manage the Details, Your Grade Depends on it. The purpose of these posters is to help students become increasingly aware of their own working memory/comprehension pictures through the activation of detail analysis. The way to manage the details is by getting the picture (activating working memory) before expressing any next transformation or solution. The high incidence of detail errors in students’ algebraic problem solving (incorrectly referred to as careless mistakes) indicates detail analysis is not (fully) engaged, meaning working memory for algebra is not established, and therefore, students are proceeding through problem solving while not being able to successfully perceive the details. This is why I require all students to show all detail transformations and do not allow for mental math to replace it. “But negative seven is close to positive seven,” laments another student who received no credit for a solution by not including the negative signage, feeling unfairly treated because a negative sign is such a small, little mark, rather than comprehending the details were not sufficiently well managed, and the difference in solutions is significant. To What Does the “Pre” in Pre-Algebra Refer? Solve surface area and volume of polyhedrons, 3-d space figures, and composite figures and have yet to be introduced to what prisms, pyramids, cylinders, cones and spheres are as well as finding the area of polygons. I believe we can all agree on the meaning of the prefix, “pre-”. In the case of “pre-” algebra, there are distinct parameters that distinguish pre-algebra from algebra 1. The function of pre-algebra is to provide the initial foundation and problem solving tools from which all future algebraic processing will emanate. This is especially critical because the developmental demands of activating working memory for algebra are different from and more challenging than those for elementary mathematics, and students’ introduction to algebra needs to be successful and strong to support the higher level expansions coming in algebra 1, algebra 2, pre-calculus, and calculus. The “pre-” in pre-algebra is about preparing students for most of what comprises algebraic problem solving: simplifying variable expressions, solving variable equations and graphing. 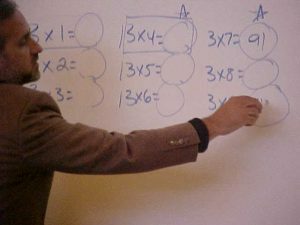 Therefore, it is within the domain of pre-algebra that students learn the integer and rational numbers facts across the four operations, as these number facts will be applied throughout simplifying and solving for all algebra. The extent of simplifying expressions in pre-algebra is basic only, mostly to learn what constants, variables, expressions and equations are and the Order of Operations, GEMDAS, and not for combining like terms which, is an early algebra 1 unit in which students learn what a polynomial is, the degree of the polynomial, and expressing polynomials in standard form. For solving equations, pre-algebra covers only the first four levels of solving equations in one variable and the first four levels of solving inequalities in one variable. Levels five through fourteen of solving equations in one variable are all covered in algebra 1. The parameter that distinguishes the pre-algebra equation solving levels from the algebra 1 levels is all pre-algebra level equations are ready to solve and all the algebra 1 levels require extra transformations and/or simplifying of expressions before the equations are ready to solve. The pre-algebra equation solving levels provide students with a solid foundation for all future equation solving: an equation is ready to solve when one variable expression in simplest form equals one constant expression in simplest form; and to be appropriate equations for pre-algebra, all variable expressions and all constant expressions are already in simplest form. Any variable or constant expressions requiring combining like terms, use of the distributive property, or having variable terms in both expressions are all exclusively parts of the algebra 1 equation solving levels. In the ratio, proportion, percent unit, pre-algebra covers the four levels of fraction, decimal, and percent equivalence, the introduction of ratios, rates and proportions, the three forms of percent problem solving, and solving basic proportions with a single variable and three constants. Solving percent change and proportions with binomial numerators and/or denominators is covered in algebra 1. The pre-algebra probability unit covers all basic probability including theoretical and experimental probability, simple, multiple, and compound events, dependent and independent events, dependent and independent events with and without replacement, and the counting principle. Permutations (nPr) and combinations (nCr) are typically presented in second semester algebra 2. The pre-algebra linear graphing unit starts with graphing on the x-axis and solving levels one through four of inequalities. Pre-algebra follows with graphing on the x-y Cartesian plane, by first introducing solving equations in two variables and connecting the infinite solutions generated by 2 variables in one equation to the graphical expression of the infinite solutions as infinite points comprising a line. From this experience students learn slope-intercept and standard forms of linear equations. The extent of the linear graphing unit for pre-algebra is students’ ability to graph any line with positive, negative, and special slopes from any given equation, and to generate the equation of any graphed line with positive, negative, and special slopes. Algebra 1 continues this development by teaching students to generate the equations of lines algebraically without seeing the line on a graph. In reflecting back over the 20 years since I decided to go public with the Making Math Real methods I had created, the most outstanding, consistent, and singular result has been the unsolicited responses from all of you sharing your excitement, passion, and deep reward in having changed the lives of your students/children, their families, and yours, too. Effecting positive change has always been at the forefront of the Making Math Real Institute’s mission and vision and is the entire reason I am so unrelentingly vigilant in protecting the integrity that is MMR. During these difficult times, I feel the most we can contribute is the goodness we do each day; and in the name of MMR, I would like to contribute a barrage of goodness. Therefore, in celebration of the 20 years of service in providing positive change, I am inviting you to share with us at the MMRI any and all stories you would like to contribute to the Barrage of Goodness Campaign. Your stories need not include any identifying information of your students or yourselves (unless you want to), just expressions of positive change through your provision of MMR that you have observed in your students/children, their families and in yourselves as well. No story is too big or too small. These can be in any format and any length, and it is my intent to publish every one of these that come in now and into the future in its own section on the website. Your stories need not include any identifying information of your students or yourselves, (unless you want to) just expressions of positive change through your provision of MMR that you have observed in your students/children, their families and in yourselves as well. No story is too big or too small. These can be in any format and any length, and it is my intent to publish every one of these that come in now and into the future in its own section on the website. In addition, I will select some of these to include in the May 13, 2017 Free Seminar: Staying the Course: Changing Lives for Students, Families, and Teachers. In addition to being Founder, Director, and Creator of Making Math Real, David Berg is also an artist, musician, and composer. As an artist, David has exhibited internationally and his work is in public and private collections around the world including the Los Angeles County Museum of Art, San Francisco Museum of Modern Art, The Fine Arts Museums of San Francisco, The Contemporary Art Museum of Hawaii and more. 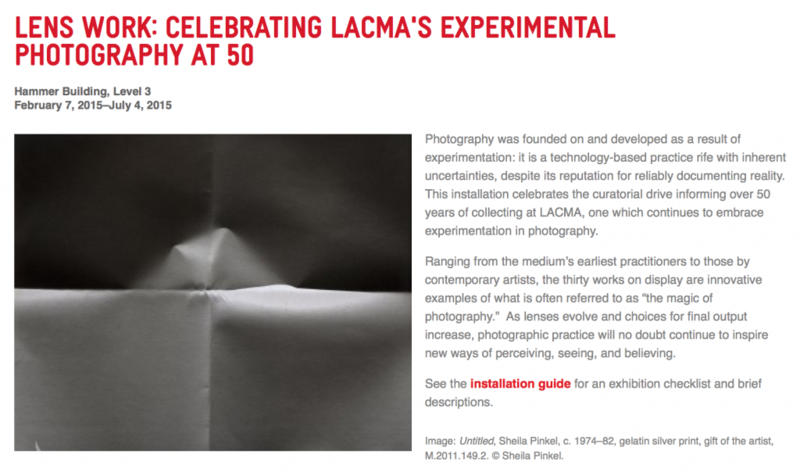 Recently, David was included in his fifth exhibition at the Los Angeles County Museum (LACMA), “Lens Work: Celebrating LACMA’s Experimental Photography at 50”, and LACMA has just acquired two more pieces of David’s work for their permanent collection. Click here to view David Berg’s art résumé. Click here to view the full artist list for Lens Work. As a musician and composer, David has performed and recorded his music internationally, including on television and radio on PBS stations and at the Banff Centre for the Arts. Click the play button below to listen to “What’s On Your Belly?” (9:06) from the CD “Portraits of My Grandmother’s Daughter” Spoken Word/Music Collaboration, recorded 1994 at the Banff Centre for the Arts, Alberta, Canada. Darryl Keyes: Poet and spoken word; David Berg: composer, arranger, musical director, and plays all musical parts. As a founder and director, David is frequently asked, “Where did Making Math Real come from?” Part of the answer to this question is directly related to the significant development resulting from a long-term immersion in solving creative problems in the arts: finding solutions for expressing creative ideas in physical form. From a developmental perspective (not content), MMR’s seminal period coincided with David’s simultaneous immersion in the fine arts. David’s significant bodies of work in painting and music occurred between 1983 and 2002, as did the major initial developments of MMR. 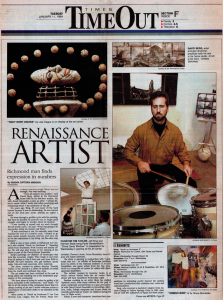 In 2002, David stopped painting, exhibiting, and performing to focus entirely on the continuous development of MMR, channeling the creative drive from art and music into the expansion of math education. The creation of MMR, like painting and composing, has been, and continues to be, an analysis/synthesis activity, requiring full lateralization and front-to-back connections (critical thinking) in the brain. The artist’s model of problem solving is entirely about this ongoing analysis/synthesis experience. The artist’s technical facility and detail analysis provide the support of solving the expression of creative ideas, questions, and problems. The artist engages limitless possibilities as potential means of solving creative problems and is best served by remaining completely open to encourage access to maximum creative resources. The artist’s model of problem solving, in combination with 40 years of intensive clinical observation of thousands of students of all ages, cultures, and diverse processing styles, has been the ongoing genesis of Making Math Real.